To revamp its antiquated voting system that dates back to the 1960s, L.A. County hired our design firm to build its next-generation replacement, a modular system that could adapt over time. And just as importantly, one that would be designed, developed and owned by the county. Working closely with L.A. County staff, our design team created a voting system that addresses the complexities unique to that voter base, including its vastly diverse population and its myriad election laws and policies. It was imperative for designers to build a system that would be useful and accessible to all types of voters: those who are vision and hearing impaired, in wheelchairs, have learning disabilities, are unfamiliar with technology, speak languages other than English – voters of all ages and backgrounds. The resulting prototype is a voting device that’s customizable for different user experiences. A touchscreen allows any voter to easily navigate the ballot by advancing through different screens showing lists of candidates and ballot measures. For those with vision impairment or reading disabilities, an audio and controller experience guides voters through their options with a push of a few simple buttons. And voters who prefer to read the ballot in a different language – Spanish, Chinese, Korean, or any one of the 11 languages supported by the county – can choose their preference on the same machine. Once they’ve tapped in their selections on the device, they receive a printed paper ballot that goes in an integrated ballot box (the use of traceable paper ballot is still mandated by law). 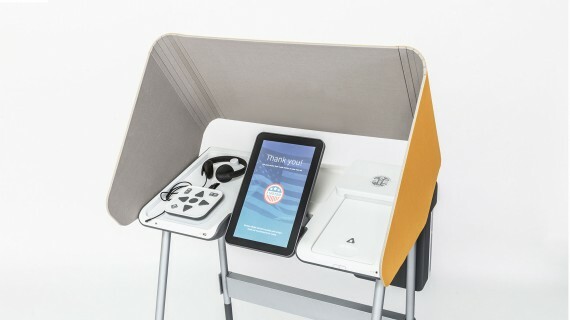 Just as we’re able to use our mobile devices to simplify our lives for everything from shopping online to fetching a taxi, the new prototype also allows voters to participate in the ultimate act of democracy with the same ease and accessibility. Mark your votes on your cell phone at your convenience, then go to a polling station to transfer your selections from your phone to a paper ballot, and cast your ballot in a ballot box. It’s this convenience factor that officials hope will ultimately make the act of voting more meaningful. L.A.’s new voting system has the potential to influence how other counties across the country update their outdated systems. The county’s next move is to choose a manufacturer that will build the system through a request for proposal process. By 2020, Los Angeles County citizens should be exercising their right to vote with their future-forward system.